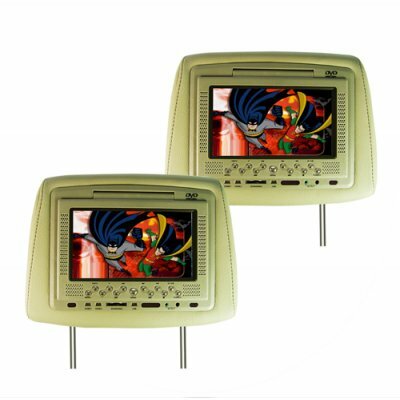 Successfully Added Headrest DVD Player and NES Emulator- 7 Inch LCD -Pair -Tan to your Shopping Cart. Headrest DVD Player and NES Emulator- 7 Inch LCD -Pair -Tan. If you do not know how to entertain the kids on those long trips, then why not think about getting one of these Car Headrest Multimedia Units that your family members and friends in the back seat can enjoy. It will play almost every format disk that you could ever want, has a built in FM transmitter to send sound directly to your cars audio system, a Memory Card Reader and USB Slot for your digital entertainment, AV OUT and IN for auxiliary monitor and speaker connections, and much more. Add some extra fun to long road trips with these easy DIY (do it yourself installation) Headrest Entertainment Units and get them at a Chinavasion factory direct price. In stock now for immediate shipment, get yours now!